Your favorite flower’s scent is paired with a handmade holder inspired by its beauty. Go ahead, stop and smell the roses—on the way to the kitchen, in the hall, next to the tub. This collection of candles pairs your favorite flower's scent with a jewel-toned holder inspired by its beauty. 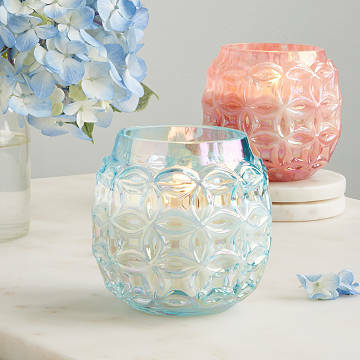 Each is hand-blown using a vintage mold from the historic Fenton glass factory, then filled with soy wax. Inhale cherry blossoms blended with hints of sandalwood and magnolia, or red roses that capture their fragrance in full bloom. Choose from five popular flowers, and when the wax is gone, fill the holder with the real thing— or anything else pretty enough to put on display. Handmade by artisans in Washington. See scent profiles for each flower candle here. Trim wick to 1/4" before lighting. Keep candle free of any foreign materials including matches and wick trimmings. Only burn the candle on a level, fire resistant surface. Do not burn the candle for more than 4 hours at a time. Discontinue use when 1/2" of wax remains on bottom. Never leave a burning candle unattended. Keep wick trimmed to avoid big flame, don't burn longer than 4 hours at a time to avoid overheating. Keep away from drafts, pets and children. Burns up to 60 hours. We recommend reusing your hand blown vessel even after you have burned through all of your candle. To remove the leftover wax, freeze the vessel for several hours and the wax will harden and shrink allowing you to pop out the residual wax. Clean the container with soap and water. Or, carefully pour hot water into the vessel, the water will melt the wax and and the wax will float to the top. Let the water cool and remove the wax with a strainer. Clean the container with soap and water.